Abstract. Inland valleys are seasonally waterlogged headwater wetlands, widespread across western Africa. Their role in the hydrological cycle in the humid, hard-rock-dominated Sudanian savanna is not yet well understood. Thus, while in the region recurrent floods are a major issue, and hydropower has been recognized as an important development pathway, the scientific community lacks precise knowledge of streamflow (Q) generation processes and how they could be affected by the presence of inland valleys. Furthermore, inland valleys carry an important agronomic potential, and with the strong demographic rates of the region, they are highly subject to undergoing land cover changes. We address both the questions of the hydrological functioning of inland valleys in the Sudanian savanna of western Africa and the impact of land cover changes on these systems through deterministic sensitivity experiments using a physically based critical zone model (ParFlow-CLM) applied to a virtual generic catchment which comprises an inland valley. Model forcings are based on 20 years of data from the AMMA-CATCH observation service and parameters are evaluated against multiple field data (Q, evapotranspiration – ET –, soil moisture, water table levels, and water storage) acquired on a pilot elementary catchment. The hydrological model applied to the conceptual lithological/pedological model proposed in this study reproduces the main behaviours observed, which allowed those virtual experiments to be conducted. We found that yearly water budgets were highly sensitive to the vegetation distribution: average yearly ET for a tree-covered catchment (944mm) exceeds that of herbaceous cover (791mm). ET differences between the two covers vary between 12% and 24% of the precipitation of the year for the wettest and driest years, respectively. Consequently, the tree-covered catchment produces a yearly Q amount of 28% lower on average as compared to a herbaceous-covered catchment, ranging from 20% for the wettest year to 47% for a dry year. Trees also buffer interannual variability in ET by 26% (with respect to herbaceous). 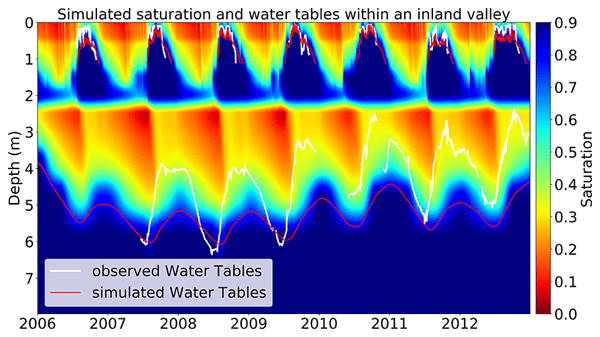 On the other hand, pedological features (presence – or absence – of the low-permeability layer commonly found below inland valleys, upstream and lateral contributive areas) had limited impact on yearly water budgets but marked consequences for intraseasonal hydrological processes (sustained/non-sustained baseflow in the dry season, catchment water storage redistribution). Therefore, subsurface features and vegetation cover of inland valleys have potentially significant impacts on downstream water-dependent ecosystems and water uses as hydropower generation, and should focus our attention. How to cite: Hector, B., Cohard, J.-M., Séguis, L., Galle, S., and Peugeot, C.: Hydrological functioning of western African inland valleys explored with a critical zone model, Hydrol. Earth Syst. Sci., 22, 5867-5888, https://doi.org/10.5194/hess-22-5867-2018, 2018. The hydrological functioning of western African headwater wetlands remains poorly understood, despite their potential for small-scale farming and their role in streamflow production. We found that land cover changes significantly affect water budgets, and pedo-geological features control dry season baseflow. 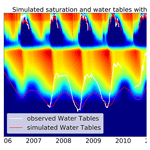 These are the results of virtual experiments with a physically based critical zone model evaluated against streamflow, evapotranspiration, soil moisture, water table and water storage data.